Take App Race Control to the next level with ARC AIR. Last year we launched our revolutionary slot car system, ARC ONE, allowing you to wirelessly create and manage races with a smart device and the ARC app. Now we present the next level in App Race Control technology - ARC AIR - with exciting new features such as wireless controllers with rumble pack and braking, plus new app features such as weather conditions and race incidents. 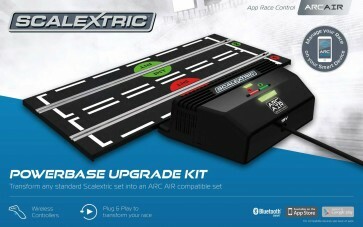 This ARC AIR Powerbase Upgrade Kit is compatible with any analogue Scalextric set, unlocking a whole new world of slot racing. New for 2016 - Scalextric ARC AIR Powerbase Upgrade Kit.